If you’ve been following me for a while, you know that I like to play with a lot of different types of cameras. I’ve gotten a good amount of questions as to what sizes film comes in. Then I realized, when I say things like “35mm” “620” and “120” film, most of you who aren’t photographers probably have no idea what I’m talking about. I figured I’d do this mini post so everyone is on the same page! Hi! 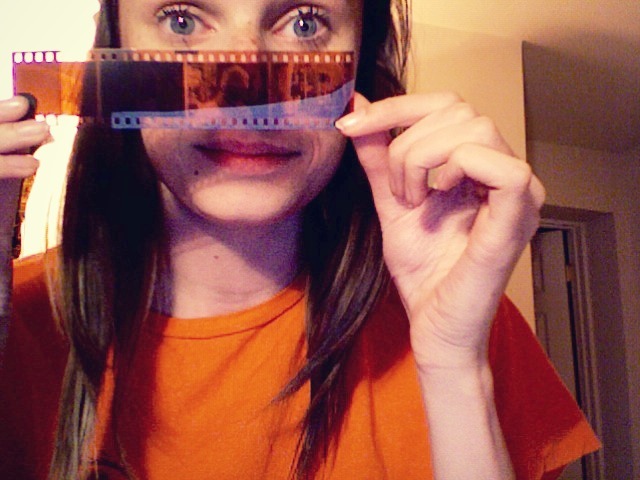 This is what one strip of 35mm film looks like. You recognize that? Well, good, I had hoped you would. Gives me hope that the generation of film users is not lost! Let us begin with a familiar friend, 35mm. 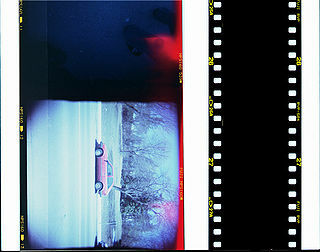 35mm film is the every day “normal” film you have most likely encountered before. It is what the Canon AE-1, the Minolta x-700, and the FishEye2 cameras take. 35mm can come in black and white or color and is typically cut into strips of four frames if you get it processed at a lab. 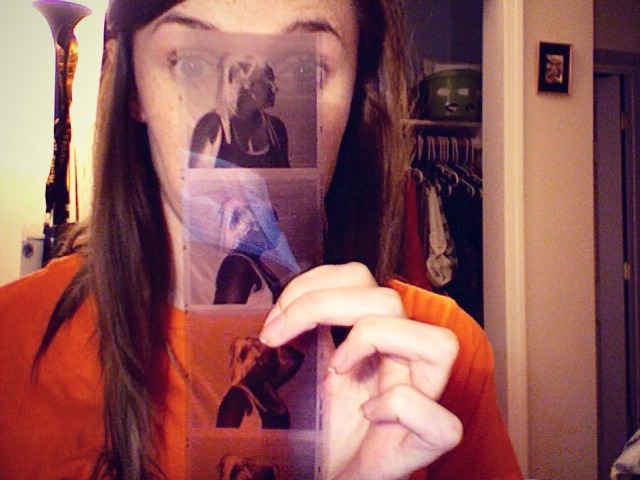 Processing 35mm all by yourself is easy! Well, processing black and white all by yourself is easy, processing color is a whole other ballgame we aren’t ready to play yet. And by “we” I mean “I”. If you want to try it yourself, this website right here has a very nice tutorial with photos and step by step instructions! If you are using 35mm I recommend Kodak Porta 400 color and Tri-X black and white. I have gotten beautiful results with both! Hey. This is 120 medium format film shot with a Hasselblad camera. Note how much bigger the negatives are! This provides even more superior resolution for printing. Next we have 120 film which we call medium format. Medium format refers to film larger than 35mm and smaller than 4×6 which is known as large format. 120 film is used in cameras like the Lomography Diana F+, the DuoFlex2 (well actually 620 film but 620 is almost the same as 120, just on a different sized spool) and a Hasselblad. 120 is a bit trickier to load than 35mm but you’ll get the hang of it! Paper protects the film inside the spool and you have to be very careful when loading and tightening at the end; the 120 doesn’t need to be rewound like 35mm does, it rewinds itself back into its spool as you shoot. All you do at the end is lick the sealing tab and pull taught and you are good to go! In comparison 35mm is easier for beginners because all 1hour photo labs will process it, 120 is typically only processed at professional labs like Tech Lab. I would keep talking about more, there are loads of film sizes! To be honest, 35mm and medium format are the only ones I have tried out and plan to try out at the moment. Large formats, are well, large. Not very convenient for the time being. If you read my blog for advice on camera using, I definitely recommend trying out both! There are photographers who will swear by one or the other but I personally think that they have a uniqueness to each of them. I like the size of medium format and the ability to make my images giant but I also love having 36 exposures on one roll in 35mm. Now that you are educated on the two different types of film I use, I can ease my burdened mind and carry on rambling about film without worry! Nice review. Just wanted to comment here that people *may* have heard photographers talk about 6×6 or 6×9, or 645. These are references to different kinds of cameras that all shoot 120 film. The number 120 is a meaningless number that Kodak made up. The other numbers are actually centimeters. So 6×6 is really 60mm by 60mm square, 6×9 is 60mm by 90mm long (same proportions as 35mm but much bigger), and 645 is 60mm by 45mm, or half of 6×9. There are other odd sizes like 6×7 and 6×8 but they are not encountered often. All modern “medium format” cameras take this 60mm tall film. There is another version of it called 220 film which is twice as long as 120 film and lacks the paper backing. This film is rarely encountered by anyone except professional photographers and can only be used in professional grade medium format cameras specifically designed for it. 35mm film, as you may have guessed by now is literally 35mm tall, and is actually the same kind of film used in many movie cameras. This is why it has the sprocket holes! The only major differences between 35mm still camera film and movie film are the much shorter rolls it comes in, and the lack of a magnetic strip for recording sound. Nice. I have only ever heard of 35mm. So then what difference would the final outcome be? That being the finished product-the photograph. Well, it looks the same depending upon the size you print it. 120 often has a higher resolution and different dimensions as well as the capacity to be printed HUGE. Also, many cameras took larger formats first until the 35mm was perfected. There are some other sizes in between 120 and 4X5 (like 2X3), I’ve never go around to figuring out if those are considered medium format or large format? Think Polaroid and Fuji instant films for example. Also – when shooting 120 film, the film does not rewind itself. You have two spools: A supply spool (your film comes on it) and a take-up spool, typically the leftover supply spool from your last roll. You load both into the camera and the film is transfered from the supply spool to the take-up spool during shooting and frame advance. Probably a cool note to add for lomography and toy camera shooters is that typically a Holga will come with both a 6X6 mask and a 6X4.5 mask. You can shoot either size with a holga depending on which mask you put in the camera and the numbers on the back of the paper are designed to advance the film correctly depending on the mask you use. All very good information! I have yet to experiment with sizes other than 120 and 35 so I stayed away for this particular post. Those are the most popular sizes I see in amateur use. I knew that about the Holga, I believe you can do that on a Diana as well?